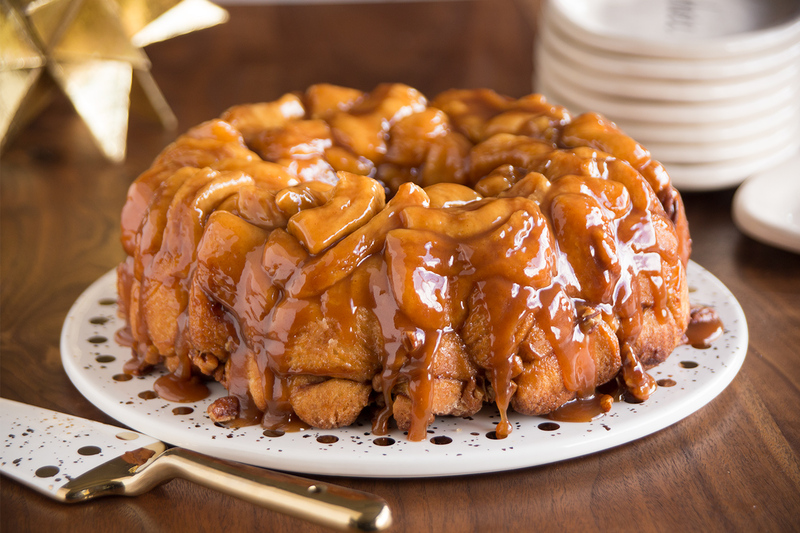 Caramel ice cream topping is the ingenious ingredient that gives this Monkey Bread recipe its warm and gooey greatness! Cut thawed cinnamon rolls into quarters. Reserve frosting for another use. Dip each roll piece into butter and roll in sugar. Arrange roll pieces in a sprayed bundt pan, alternately with pecans. Drizzle caramel topping over rolls. Cover with plastic wrap and let rise until double in size*. Remove wrap and bake at 350 degrees F 35-40 minutes. Cover with foil the last 10 minutes of baking. Cool 1 minute and invert onto serving platter. *If using Rhodes Anytime Cinnamon Rolls, they do not need to rise. Bake at 350 degrees F 25-30 minutes. Love the cinnamon roll bubble bread.